Remember when Apple expressed reservations against laptop-tablet hybrids? Or the time when Steve Jobs ridiculed the use of stylus in tablet devices? Those were the days. People at the Cupertino-based tech company have certainly retracted their earlier resolves with the introduction of the 12.9-inch iPad Pro—a massive version of the iPad developed and designed for power users. Staunch adherents of mobile devices have long dreamed of having a tablet that could completely replace their laptop computers. Apple fans had initially assumed that their iPads can do the job but they eventually realised that their MacBook laptops remain irreplaceable in terms of computing power. Then comes the 12.9-inch iPad Pro. Announced during an Apple Special Event on 9 September 2015, this device is the biggest, fastest, and most powerful iPad to date. With the massive size and price however, consumers might have a hard time deciding whether they are better off buying an iPad Air or a MacBook instead. Advantages of the 12.9-inch iPad Pro: Reasons why you should buy? 1. Powerful version of the iPad Air 2 or any other tablet. There are people who are perfectly okay with using their smartphones or tablets as their primary computer. A device with a large display seems perfect for these people. With a massive screen real estate, the 12.9-inch iPad Pro is an effective productivity tool even without the smart keyboard cover. Power is another advantage of iPad Pro. Under the hood, the Apple A9X 64-bit system-on-a-chip powers this device. This is specifically a 2.26 GHz dual-core 64-bit ARMv8-A processor that has purportedly double the memory bandwidth and double the storage performance of the Apple A8X. Coupled with a 4GB LPDDR4 RAM, the 12.9-inch iPad Pro is indeed the most powerful iPad to date that can easily take advantage of multitasking features or run resource-intensive apps. 2. Perfect entertainment or media consumption device. Watching movies or streaming videos on a laptop is still odd because of its somehow bulky and elaborated clamshell design orientation. Smartphones and tablets with decent screen display quality are more favourable because of their mobility and portability. However, their limited screen size proves that they are not for sharing. The iPad Pro has a 12.9-inch Retina display and a 2732×2048 resolution at 264 pixels per inch. Having these large screen size and display quality mean that one of the advantages of the 12.9-inch iPad Pro is that it is a prefect entertainment and multimedia device. Apple has also crammed in four speakers into the iPad Pro. This device pumps out three times more output than any other iPad. Thus, although this device is large, there is no need to carry a Bluetooth speaker to rev up the sound from movies or music. The longer battery life is also a plus. A user can enjoy longer hours of video or music playback than their smartphones or other tablets. 3. Suitable for creative and corporate professionals. Apple has made it clear that the iPad Pro is for creative professionals and business-oriented individuals. It is certainly not for casual social media users or mobile gamers. The powerful hardware of the iPad Pro can easily take advantage of various creativity apps—including the GarageBand for producing music, iMovie for editing 4K videos, Adobe Photoshop Fix for image retouching and restoration, and uMake for sketching and drawing, among others. Office productivity apps such as Microsoft Office and Evernote make the iPad Pro a useful and powerful tool for corporate professionals. 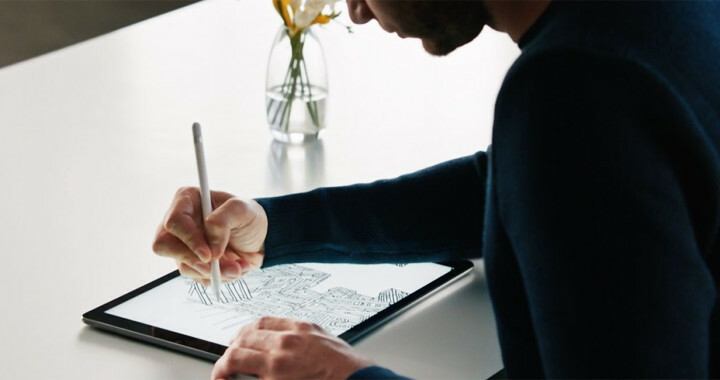 Apple has also expanded the power of Multi-Touch with the Apple Pencil. This stylus is sensitive to both tilt and pressure to allow digital artists to create a range of artistic strokes and effects. Then there is the Smart Keyboard that also doubles as a cover for the iPad. The water-and-stain resistant keyboard features 64 seamless keys for better typing accuracy. 1. Not really a better replacement for the iPad Air 2. Although the iPad Pro is a powerful alternative to the iPad Air 2, this does not mean that it is a better replacement. This is especially true if a user already owns an iPad Air 2. The performance boosts of the iPad Pro makes it more powerful but the iPad Air 2 remains a powerful device. In other words, both devices are capable of running the same apps with minimal to zero performance difference. Even the iPad Mini 4 is as powerful under several circumstances or usage preferences. Size can also be a disadvantage. With the bigger physical dimension, the 12.9-inch iPad Pro is a half-baked MacBook or laptop. Users with an iPad Air 2 should just stick with what they already have because it is as powerful but more mobile and portable. In other words, one of the disadvantages of the 12.9-inch iPad Pro is that it does not complement other Apple devices, such as an existing iPad and a MacBook laptop. The device is simply not a standard tablet replacement and is most certainly not a MacBook replacement. 2. Restricted computing capability and usability due to OS limitations. A capable processor and operating system power the iPad Pro. The device is the faster iPad to date. However, when compared with other laptop-tablet hybrids such as the Windows Surface Pro 4, the 12.9-inch iPad Pro is not as powerful and capable. The iPad Pro remains a mobile device powered by a processor and operating system designed for mobility and portability. This means that although it remains a powerful tablet device, it is not an actual laptop replacement. The limitations of iOS is another disadvantage of the iPad Pro. There are no true and flexible multitasking in iOS. Samsung devices even have better and true multitasking compared to the current functionalities of the new iOS. Furthermore, mobile operating systems have always hard a hard time coming up with apps that are as powerful and functional as those software designed for Windows OS or Mac OS X. Power users should not expect this device to replace their MacBook Air or MacBook Pro, or Windows laptops. It is also worth mentioning that there are few apps that are currently optimised to take advantage of the screen size and full potential of the iPad Pro. 3. The iPad Pro is expensive for its functionality. Price tag is another disadvantage of the iPad Pro. The entry model of the 12.9 iPad Pro retails at USD 799. This is a 32GB with Wi-Fi connectivity—quite expensive for a device with a limited storage capacity and connectivity. A user can only do so much with a 32GB worth of storage. For 128GB Wi-Fi model, the iPad Pro retails at $949. The price jumps to USD 1,079 for the 128GB Wi-Fi and cellular model. It is also worth mentioning that the Apple Pencil and Smart Keyboard are sold separately. Buying both accessories makes the iPad Pro as expensive as a decent laptop. Take note of the 11-inch and 13-inch MacBook Air as an example. But the functionality of this device falls short when compared to equally priced laptops in the market. 4. Design and hardware quirks that can be annoying. Another disadvantage of the iPad Pro is that it does not have a mouse support and the Smart Keyboard does not have a touch pad. This means that user depends solely on touch-based input. The lack of mouse input can be tiresome. This is more noticeable when using the device to edit videos or process documents. While the Apple Pencil is a smooth and precise stylus input, it is quite odd that Apple forgot to add a slot or any area to secure this peripheral. The screen angle is also not adjustable when using the Smart Keyboard. A user would have to be content with a fixed angle. This can be limiting for individuals who have eyesight problems or those who use their laptops in a particular position. It is also heavy for a tablet. A portable device should be easily held using one hand. For the iPad Pro, a user would need both hands. Just imagine taking and using this device on-the-go. Conclusion: Why you should or should not buy the 12.9-inch iPad Pro? There are advantages and disadvantages to owning this massive iPad. It is undeniably the most powerful iPad to date because of its advanced hardware specifications. Based on the aforementioned advantages of the 12.9 iPad Pro, some creative and corporate professionals might find this device useful. With a massive Retina display, consuming contents is more engaging in this device. This is also true for producing some contents. A bigger screen means a bigger workspace. However, considering the aforementioned disadvantages, the 12.9-inch iPad Pro is nowhere better than the iPad Air 2. It is also not a laptop alternative. Perhaps, this device needs more apps and other accessories that could fully unlock the full potential of its impressive hardware specifications. Until then, the 12.9-inch iPad Pro is a mere complementary device for those with extra dollars to spare. It is still far from becoming a laptop-killer.